Do you have your ticket to Tableau Conference yet? Do not miss out on this chance to join thousands of data rockstars in this great city! Get your tickets now. My name is Ciara Brennan, and I started in Tableau at the end of July as a Program Manager for the Community. Previously I worked in Hewlett Packard in a variety of roles from Failure Analysis to Engineering to Customer Insights & Analytics. My initial background is in Chemistry, and then later, Technology Management. Earlier this year I completed a Professional Diploma in Digital Marketing, which I loved as I’m particularly interested in customer support through online and social.I started using Tableau when I was a Program Manager in HP, and I loved how with just a few dashboards it could really bring to life the key customer insights I wanted to articulate from my datasets. I’m excited to be part of the Tableau team and I really look forward to getting involved in the Community. Feel free to get in touch to say hi! + Has your local Tablaeu User Group participated in the Tableau Viz Games? 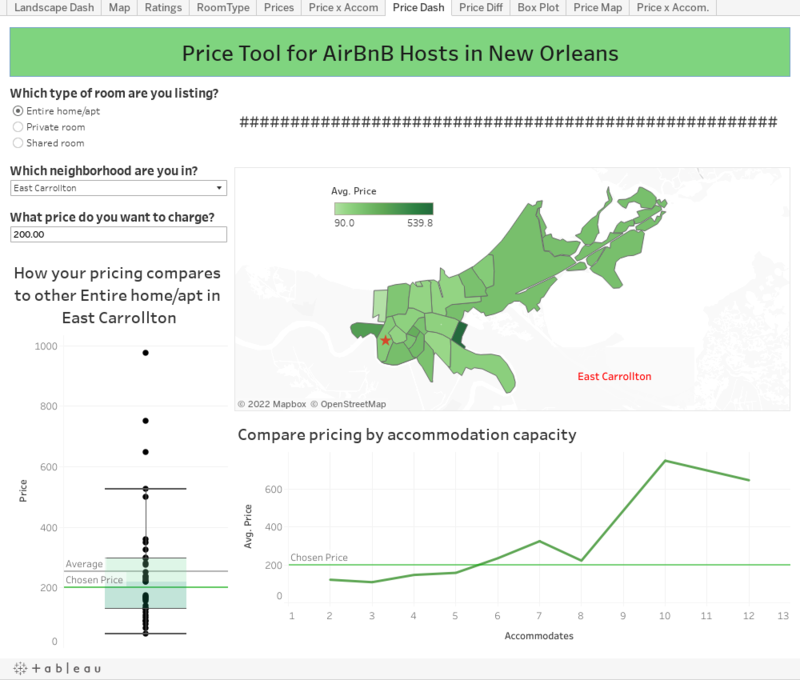 This year we challenge our user groups to build a Viz that showcases the magic of New Orleans. Contact your local user group to participate and make sure to get the entry in by September 28th at 3PM PT! Find out more about the Viz Gamse here. This week we would like to recognize three shining stars of the Tableau Community for their contributions. Andrew Bickert achieved the "Helpful is my middle name" badge for having 50 of his answers marked as helpful by other Communtiy Forums users. Both Ankit Bansal and Srinidhi Narayan both achieved "Questions for Breakfast!" badge for having 25 questions marked as Correct! Thank you all for your amazing contributions! Carolina de Mello e Souza is a user experience designer at Tableau and took the "Most Talked about Thread" title by storm this week. Asking for feedback on the way customers are using dashboard containers in workbooks. There is some amazing back and forth that can give somwe insight into the future of dashboard containers. Read up on thread and add your comments! The top voted idea this week in the Tableau Community Forums Ideas space. The idea is an old one that the development is taking very seriously, Control what displays in View Data, the team is still working on this. The idaea was submitted on February 22nd, 2012 and has been our top voted idea for several weeks. + Rodrigo Calloni recently released a guide for Tableau in Portuguese! Share with your counterparts in your Brazillian office so they can leverage the power of Tableau. Check out the new guide here. + A new Interworks blog on Making a Packed Circle Grid in Tableau was written by Robert Rouse. There is a lot going on in the community lately as we start setting our eyes on Tableau Conference in a few months. Tableau employees put a huge effort into making sure that attendees get the absolute most out of Tableau Conference each year. Have you registered for Tableau Conference yet this year? Don't delay as we sell out every year. Register via this link if you have not signed up yet. My favorite viz was this one designed by Andras Szesztai with data covering the journey of life of the great Anthony Bourdain. + Zen Master, Bridget Cogley has put together a great post titled 'How the EXCEL do I do Mapping in Tableau? The Toddler Guide to getting on Point - TableauFit ' to help you get going with shapefiles and mapping in Tableau. 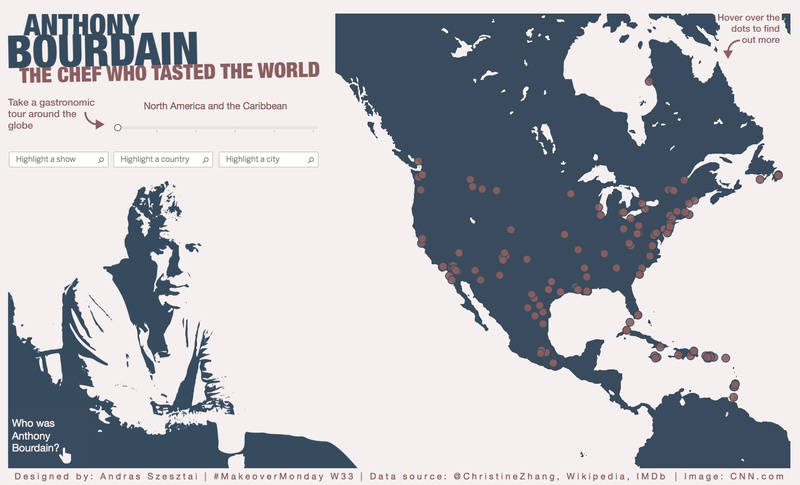 This resource is one you will want bookmarked the next time a map project in Tableau is on your to do list. A huge Thank you goes out to Zen Master Ken Flerlage who achieved the Answer Wizard award. This is the most challenging of all the awards on the community forums as it requires that over 100 of the replies posted have been marked 'correct' by the original poster of the question. Thank you Ken for all your contributions to the forums! In another remarkable achievement, Ritesh Bisht achieved the Question Slayer badge for 50 correctly marked posts this week as well. Thank you to Ritesh. The most viewed thread in the forums this week was started by Peter Fakan in his post titled Has anybody ever done this type of viz in Tableau ? - where Zen Master, Shinichiro Murakami recreates a customer 'turnip graph'. Bookmark this one for the next time you need such a graph as it is somewhat similar to our own Crow's Nest. The Top vote getter this week in our Ideas area is Allow Server Administrators To View As Other Users. This idea gained an additional 9 votes this week. Thank you to Adam Freeman for this idea post from 2016. Rahul Motwani wrote up a blog to share the details of the new Tableau Mobile for the Blackberry Dynamics Platform. Click on the link to learn more. Keep visualizing and have a great safe last month of summer! Welcome to the Community Digest for the week of August 6th! This upcoming week(8/8-8/15) I will be attending a music festival, Shambhala Music Festival, on a farm on the east side of British Columbia, Canada. Music is one of my life long passions. Going ot concerts, from small bands in dive bars, to WaMu Theatre in Seattle, to festivals with tens of thousands of people is where I spend most my money. One of my other passion is charitable work. 5 guys, Will, Ben, Joachim and Ollie, from the UK combined there passion for music and promoting mental health in The Song Cyclists fundraiser for the UK based charity for mental health, Mind. Traveling over a 1000 miles and up 55,000 feet of elavation. This was quite a journey! Viz created by Ollie Clarke. More by Ollie and to see the interactive version of the Viz above please go here. + Are you excited about Tableau Extensions! To provide the best support for our users using Tableau Extensions we have create a new space in the Community Forums just for you. Check out the Extensions API here. + Have you heard of Tableau Doctor? Come work with Tableau Experts face to face on technical issues at Tableau Conference in New Orleans, LA. Register and learn more on the #TC18 site. + This week we would like to recognize meenu choudhary for achieving the Helpful is my middel name badge for having 50 posts on the Tableau Community Forums marked as helpful! A huge congrats to Naveen B who achieved the Help one, help all! badge for having 100 of his posts marked as helpful! Thank you both for your contributions! + The top voted ideas for this week is Apply number formatting inside a calculated field originally posted by Russell Lamb and continuing to gain traction. Currently the idea has 629 votes. Please continue to vote on the idea to show support for this feature. + Zen Master Neil Richards has a written several new blog posts about Iron Viz and gaining Viz inspiration. Feel free to check them out at the below links and the rest of the Neil's blog, Questions in Data Viz. + Do not miss your chance to compete in the third and final feeder for Iron Viz! Entries are closed on August 28th. Check out this link for details!